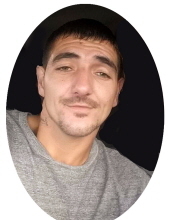 Lucas Scott Vanderpool, age 33, of Morehead, passed away Sunday, November 25, 2018, from injuries sustained in an automobile accident. Born March 21, 1985, in Lexington, he is the son of Mabel Isaacs Tuggle (and stepfather Rex Tuggle) of Lexington and the late James Arkie Vanderpool. He is also survived by his wife, Latoria Burton Vanderpool; two sons, James Vanderpool of Booneville, Jordan Vanderpool of Morehead; three daughters, Aliyah Vanderpool and Sierra Vanderpool of Booneville and Sophia of Lexington; one brother, Matthew Tuggle of Lexington; one stepson, Cameron Hamm, and one stepdaughter, Cassandra Erwin, both of Morehead; other relatives and friends. Lucas was a former employee of Maclellan Industrial Services and enjoyed spending time with family and friends. Graveside services will be held 1 p.m. Friday, November 30, 2018, at Beatty Place Cemetery in Beattyville, KY, with Brother Gary Thomas officiating. Friends will serve as pallbearers. To send flowers or a remembrance gift to the family of Lucas Scott Vanderpool, please visit our Tribute Store. "Email Address" would like to share the life celebration of Lucas Scott Vanderpool. Click on the "link" to go to share a favorite memory or leave a condolence message for the family.